Arizona State Hospital (Phoenix, AZ) opened in 1887 with 61 patients. Its building style is a cottage plan and in its peak (1950’s-60’s) served around 2000 patients. 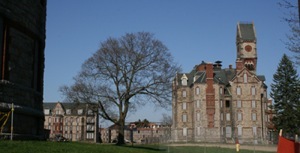 While the hospital is still operational, most of the original historic buildings have been demolished. The hospital now (as of 2011) operates mainly as a Forensic Hospital.